The MP-04S Convoy Sleep Mode figure will be made as a limited edition run in Japan of just 2010 pieces. The green-colored glowing Matrix will be accompanied with all of the accessories as the previously released versions of MP-4, including the trailer. Each box will be labeled with an edition number between 1 and 2010. Measuring approximately 12” tall, the MP-04S Masterpiece Convoy Sleep Mode & Trailer Complete Version is a mixture of plastic and die-cast, accompanied by Ion Blaster, gun Megatron with scope, stock and silencer, Energon Axe, the Matrix of Leadership, and Trailer/Combat Deck. The flat-nosed truck mode is outfitted with rubber wheels and working suspension; the robot mode’s aesthetically-integrated articulation provides intricacies such as working finger joints and adjustable mouthplate. 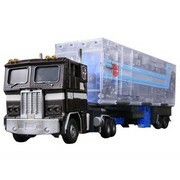 Convoy’s opening chest housing grants access to the Matrix of Leadership accessory. This version of Prime is rendered in the lifeless shades of grey and black assumed by Prime’s chassis in the aftermath of the Decepticons’ assault of Autobot City. Arriving at a crucial moment, Prime plowed through multiple Decepticon warriors in the process of working his way to Megatron. In the ensuing hand-to-hand duel, Megatron, despite his initial boastful vow to destroy Prime with his bare hands, implements every oddly discarded weapon and piece of detritus he can find. When Optimus finally gains the upper hand, retrieving his gun, Hot Rod launches his own blundering attack against Megatron, enabling the Decepticon leader to use Hot Rod as a shield while he blasts Prime repeatedly with a discarded pistol. Prime finally delivers the decisive blow, crushing Megatron’s chest, although he succumbs to his own wounds immediately afterwards. As Perceptor delivers his sorrowful prognosis to the small handful of Autobots surrounding the ebbing Autobot leader, Optimus produces the Matrix of Leadership, bestowing the fabled artifact to the reluctant Ultra Magnus.